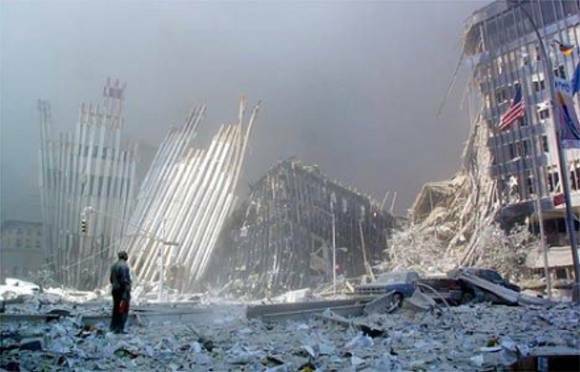 Amalek and 9/11: Remember to Forget! Now this is odd: in this commandment regarding the Israelites’ arch-enemy, the Amalekites, the Torah commands us to never “forget” to “blot out their memory.” What could it possibly mean to “remember to forget” your enemies? While this imperative might at first seem confusing or contradictory, I’ve come to believe it offers us a profound insight into the spiritual effects of remembrance in the wake of trauma. In exposure therapy your goal is to have less fear about your memories. It is based on the idea that people learn to fear thoughts, feelings, and situations that remind them of a past traumatic event. As I read this description, it occurs to me that our regular reading and discussion of the Amalekites’ attack represents a kind of “spiritual exposure therapy.” I strongly believe that the goal of this regular remembrance is not to wallow in our victimization or to fire up feelings of revenge, but precisely the opposite: by telling the story, we seek to “blot out” or liberate ourselves from the painful, crippling impact of these memories. In a sense, this commandment bids us to eradicate the aspects of our collective traumatic past that ultimately serve to keep us enslaved and imprisoned. In the end, the ritual re-telling of these stories is not only the key to our healing but to the healing of the world itself. In their most exalted form, the acts of listening, learning and remembering are important steps toward developing empathy for other individuals and cultures. I’m particularly mindful of this teaching as the tenth anniversary of 9/11 approaches. Here are the questions I’ll be asking this weekend: How will we choose to remember this collective trauma? Will our remembrance only serve to allow our fear, anger and pain to rule over us? Or will it lead us toward a path of healing, empathy and a more hopeful future for our world? If therapy is the goal, I don’t think it’s worked. Maybe God’s strict Freudian approach isn’t as effective as more modern methods. By the way, is the Hebrew as ambiguous as the English? In the latter, the commandment “do not forget” could mean “Don’t forget what Amalek did!” or it could mean, “Don’t forget to blot out that memory,” i.e., because you’ll be tempted to keep revisiting it. From a literary standpoint, that’s a wonderful, rich ambiguity. As a commandment, maybe a little more clarity would have been helpful! It’s okay to remember painful thoughts or experience, as long as you don’t wallow in them, allowing yourself to grieve continually. After dealing with the hurt and anxiety, it is appropriate to remember that you CAN triumph over the pain and go on with life. The whole purpose of remembering is to understand your feelings, your loss, and then to deal with life’s newer challenges. By “never forget” I believe the text is telling us to be vigilent against our enemies while we must keep open the chanels for peace. By the way, the intelligence from Bin Laden’s lair revealed a viable threat to NYC and Washington, D.C., so forgive and forget doesn’t work today. The “exposure theory” is being relived in real time. The citizens of these cities must be protected no matter how an individual far from the scene chooses to “process” it.